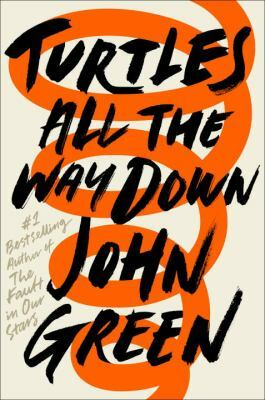 Love, love this book and it’s tongue-in-cheek writing. 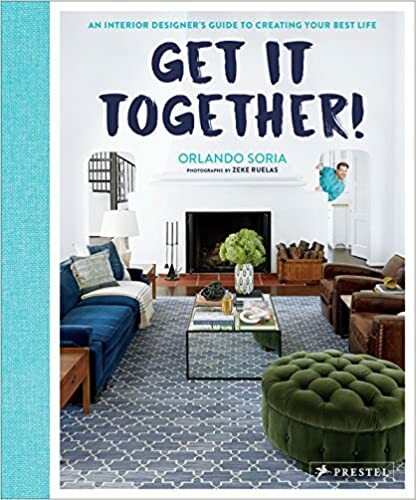 Orlando Soria is super hilarious in his common sense, life-style decorating, and overall life advice in this interior designer’s guide to creating your best life. I absolutely enjoyed his very frank and non-superficial attitude and talk about decorating your stupid space with your stupid stuff! Love this! I am currently redoing and fixing up an old home, so after reading tons and looking through 50+ interior decorating and do it yourself guides, this breath of fresh air on not taking oneself seriously is a great and funny read with some good tips to boot. So if you’re in for a laugh and want to take yourself less seriously check out Orlando Soria’s Get It Together! An Interior Designer’s Guide to Creating Your Best Life. And if you are interested in further reading, check out his hilarious blog Hommemaker. I wish I had known there were two previous “Trip” movies because I would have watched those first. 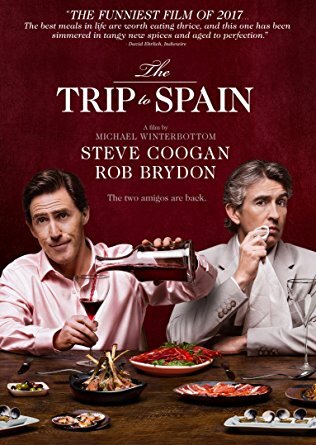 I feel I was watching the twilight of what was probably a great run for actors Steve Coogan and Rob Brydon. My aspiration to visit Spain someday was the impetus behind my selection of The Trip to Spain. I certainly got what I was hoping to see in breathtaking scenic views and Spanish cuisine. There were times I laughed so hard at the banter and celebrity impressions I couldn’t stop but about two-thirds of the way in it began to wear thin. I think this was by design since I could see that happening in real life to people with strong personalities after spending that much time together. This film is a commentary about the fickle nature of success in Hollywood and coming to terms with becoming middle-aged men, all while lodging at gorgeous hotels and running for fitness on narrow cobblestone streets. Each man is in a different stage of life, Rob has an up-and-coming career, a wife and young children and Steve is facing a stalling career, has a twenty-year old son, and a complicated long-distance relationship with an American woman. I think there are enough issues between them for both to be relatable to many viewers. Since our libraries have the previous two movies, The Trip, and The Trip to Italy available, I plan to watch them as well. I’ll view them as travelogues with a side of drama and humor. A librarian with a garden – how could I possibly resist? 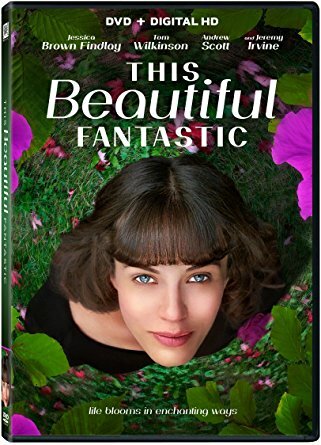 And there’s no need to resist – This Beautiful Fantastic is a charming, modern fairy tale about friendship and trust and finding beauty in the ordinary. Bella Brown is a shy, reclusive librarian (disappointingly, a bit of a stereotype, although Bella is young and does not wear her hair in a bun!) whose dream is to become a children’s book author. Lacking the confidence to show her work to anyone, let alone a publisher, she stays hidden in the shadows, avoiding her neighbors and other people, following a careful routine of work and home. What follows is the blossoming of an epic friendship (yes! I went there! Bad pun!! ), the meeting of two opposites that understand loneliness and isolation and tentatively learn to accept the other, blemishes and all and in the process, learn to let other people in as well. This is a typical British comedy with eccentric characters, dry humor and quirky settings. The library that Bella works at is endlessly fascinating – and weird. I don’t know a lot about public libraries in England, but this library is obsessed with quiet (another stereotype! 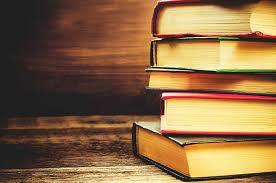 ), is stocked only with very old books and has crazy hours. Also, Bella has apparently memorized the exact location of every single volume! Bella is played by Jessica Brown Findlay who you might remember as Sybil in Downtown Abbey and the grumpy neighbor is expertly played by Tom Wilkinson; they are joined a cast of familiar British character actors. A delight for all. 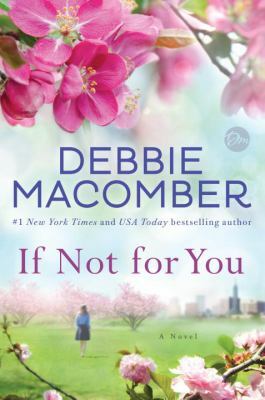 If Not for You by Debbie Macomber was a delightfully powerful read. Beth Prudhomme has been living under her mother’s thumb in Chicago for the last 25 years. Her mother has decided what she wears, who she dates, where she works, and frankly, Beth is beyond tired of this. After squirreling away money to run away, she finally talks to her father (the more level-headed parent in her family) and he agrees to talk to her mother. Beth’s mother is broken-hearted to find out her daughter wants to move away and to Portland, no less! Portland is where Beth’s aunt Sunshine lives. Sunshine and Beth’s mother don’t get along, the result of a massive fight over thirty years ago. Beth doesn’t know the reason for their fallout as neither sister will discuss it. 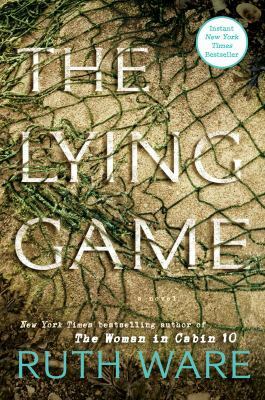 Nevertheless, Beth decides to move to Portland to restart her life after securing a promise from her mother that she will not contact or visit her for six months after her move. It sounds perfect! After their blind date, Beth gets into a horrible car accident and Sam visits her in the hospital at first because Nichole can’t come and because he doesn’t want her to be stuck there alone with no family or friends to visit. Sam soon finds himself unable to stay away, but there are barriers to the two getting together. Sam has massive skeletons in his closet that have proven to be huge trust barriers, Beth’s mom is largely against their relationship, yet the two of them are drawn together. In the end, Sam will have to figure out if he really fits into Beth’s life, whether or not he feels worthy/is wortty of her love. and if he is willing to fight for the two of them to be together. 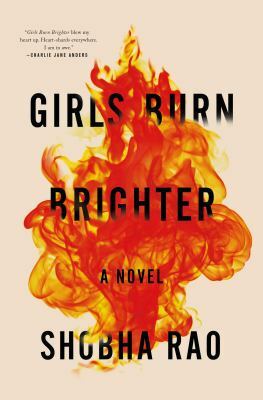 I was pleasantly surprised by this book. It wasn’t as fluffy and formulaic as I was expecting, which I really appreciated. Each character had their own separate backstory and concurrent running story that fit in perfectly with Sam and Beth: Sunshine and her art, Beth and her volunteer work, Sam and his past, Sunshine and her sister’s messy separation, Nichole and Rocco’s relationship, and so so much more. I highly recommend this. Ove, to put it kindly, is a curmudgeon. All of his neighbors are ninnies and no one knows how to do things properly. He has had a long-running feud with his former best friend and next-door neighbor Rune over a disagreement (fight) that ended with Ove being forced to step down (coup d’etat) as chairman of the Residents Association. He follows a rigid routine through his day, inspecting the neighborhood for trash, bicycles parked illegally and rule-breakers, all the while muttering about the people who drive BMWs (instead of Saabs) and nobody knowing how to bleed a radiator anymore. That routine is severely disrupted when new neighbors move in and back their trailer into his mailbox (honestly, doesn’t anyone know how to back a trailer properly?). Ove has important business planned for that day, but now he must show the new neighbor (Lanky One) and his wife (Pregnant One) the correct way to do things and his plans are ruined. Every day he attempts to finish his plan, but time and again something comes up and interrupts him, mostly because of other people’s incompetence. No one seems to know how to repair a bicycle, or open a stuck window, or how to drive a stick shift car (Ove despairs for the future of mankind) His new neighbors persist in being his friends and, although he does all in his curmudgeon-y power to discourage them, he attracts a circle of friends and loyal supporters. And a scruffy street cat. At first I didn’t like Ove. At all. But as the story unfolds and we learn more about Ove and his life it is easier to empathize with him. Life has sent Ove some tough blows and gradually it becomes evident that his grumpiness protects a kind and caring person. Also, most of Ove’s rants are quite funny (Ove wonders why a tattooed man let someone “doodle on him”) and his opinions are often spot-on. He may occasionally use politically incorrect terms (to everyone’s consternation) but he is fair to all and will fight any injustice against you, large or small. 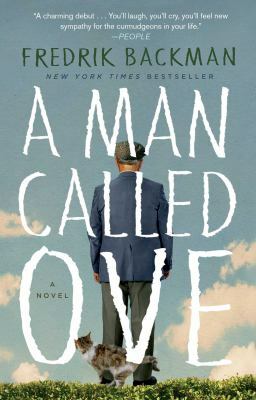 A Man Called Ove is a charming, funny (more than one person asked me what I was reading because I couldn’t help laughing out loud), heartfelt book about looking past the surface and giving people a chance. Highly recommended. Maria and Stephanie both live in Portland, but are 3191 miles apart. That’s because Maria lives in Portland, Maine and Stephanie lives in Portland, Oregon. Over the years these friends have shared their lives with each other through letters and photographs. They have managed to forge and maintain a deep bond across the distance, exchanging recipes and practical life tips and sharing the ups and downs of life. They are small town neighbors in the new world of technology. Collaborating since 2007, Maria and Stephanie continue to document their lives in their blog, 3191. Twice a week they post a diptych, a picture from of them showing what’s going on in their separate lives right now. The focus is on the small and ordinary – flowers, children at play, bounty from the garden, the outdoors and sleeping cats. Recipes and crafts are shared and advice requested and given. 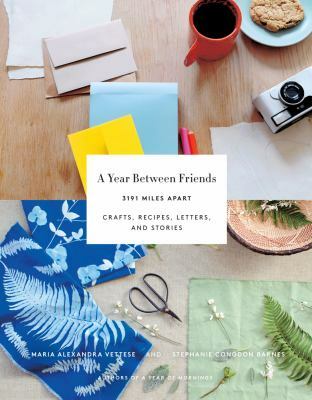 A Year Between Friends follows the same format, beginning in January and running through December, with an emphasis on the small pleasures of a life well lived. 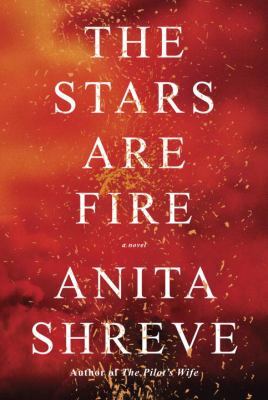 There are big events too – Maria loses her Mother unexpectedly early in the year, and gives birth to a baby girl in late July. And they aren’t always apart – Stephanie makes the trip cross country after the birth of baby Luna to spend time with Maria and her family. The photography is exquisite – you can learn a lot about perspective, cropping and lighting by studying these pictures. The real value, of course, is the stories they tell, of how different and yet how similar these lives are, their mutual appreciation of the beauty around them and the love and support they bring to each other. Besides the photos and letters, A Year Between Friends includes several crafts, most of which are lovely and practical and simple to make (although I’m not sure about the pinecone ornament – no mater how charming, that’s a lot of sewing!) There are also recipes; I’m not a cook, but I’d be happy to eat just about anything shown here! This is a lovely, quiet book, an excellent choice to end or begin the year (or anytime really), inviting you to step back and take a look at your life and what is really important. What is it you want to remember when you look back? A child’s smile? A walk through a summer-green forest? Cookies fresh from the oven? A friend’s laughter? A Year Between Friends shows just how special the ordinary can be.